Apart from attacking them with a pair of tweezers and plucking them into oblivion when I was a teenager, I've never really done anything with my brows. I don't fill them in because I've never attempted it before and to be completely honest I'm scared I'll end up looking ridiculous if I make a mess of it. It's become a thing now to judge people on their eye brows, so I'd much rather leave mine au naturel rather than risk becoming the next dodgy brows meme! This year I've pretty much abandoned the tweezers completely and my brows have grown out nicely. I just need to get round to having them shaped professionally now. I have pale skin and naturally blonde hair so my brows are quite light, too light for the dark brown/black hair I've had for nearly five years. I'm also starting to get white/grey hairs in my brows and I'd ideally like to try and cover these rather than pluck them out. I've recently dyed my hair red and as I was changing my hair colour I thought it was about time I tried to darken my brows slightly. 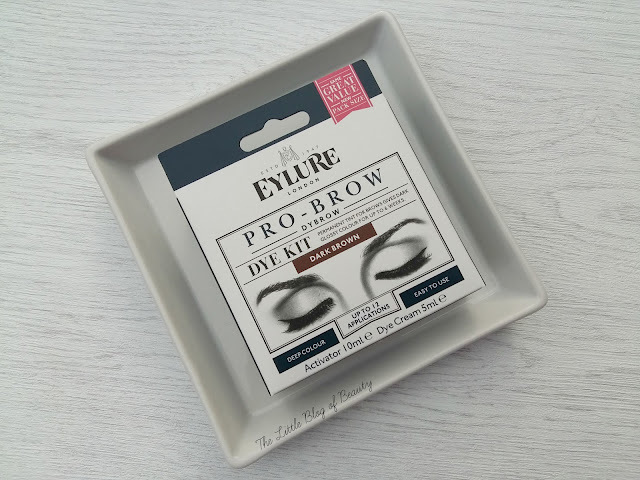 I read a post recently about Eylure's Dybrow kit, so I decided to check it out. The only shades I appear to be able to find this in are dark brown and black. I've been told that there is also a light brown shade but I've yet to come across this anywhere. I bought dark brown but then really started to panic that it might be too dark for me and I might still end up looking ridiculous. I struggled to find good before and after photos online but I was reassured by reviews that this wouldn't come out too dark, so I went ahead and gave it a try. I'm really sorry that I don't have any before and after pictures, despite having just moaned about the lack of them, but both my old camera and my phone camera won't focus that close up and my dad is currently on holiday with his DSLR (how selfish of him!). So I'm afraid I'll just have to describe the results to you. 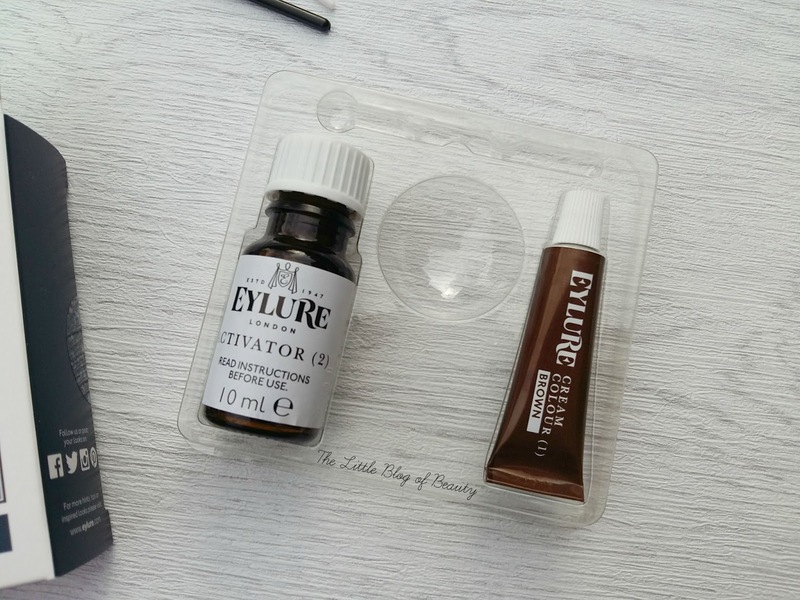 The kit comes with a cream colour, activator, a mascara wand/brush, a little plastic thing to mix with and a dome in the plastic packaging to mix this in. The kit apparently contains up to 12 applications and each application should last up to six weeks. Mixing this up is a little fiddly but not too difficult to do. You squeeze 2cm of cream colour into the dome and add five drops of activator. You then need to mix this together using the little plastic stick thing until you have a paste that doesn't drip. The first time I attempted this I thought I'd done something wrong as it didn't appear to be mixing so I threw that away and tried again. The second time I discovered there wasn't anything wrong with the mixture it just takes quite a while to get it to mix together properly. Once you have a paste you then apply this to your eyebrows with the brush. I used the plastic thing to apply the paste to the brush and then brushed this through my brows. You leave this on for a couple of minutes before wiping away with a damp cotton pad and then rinse well. You can repeat this several times in one day to achieve the colour you want. I needn't have worried about this being too dark because as I've just mentioned you can use this multiple times to achieve a darker a colour. Just one application gave me brows that were noticeable darker than they were before, but not dark enough to look out of place against my pale skin. The only thing I'm slightly disappointed about is that this did struggle to cover my white hairs. I only did this around a week ago, so I can't comment on how long it does last, but the process is definitely simple enough to do every few weeks if required. 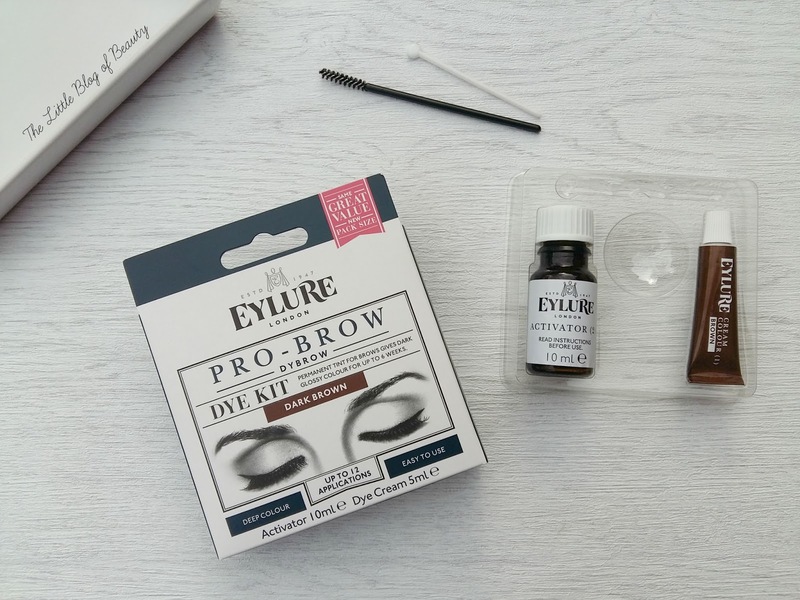 This little kit is just £7.99, which I believe is cheaper than one professional brow tint, so this is definitely very good value. Have you ever tried tinting your bows at home?